UPDATE 4: 7:18 PM A well-defined tornado signature is showing up in Eastern NY/Western CT.
Storm arrives shortly in Springfield, about an hour in Worcester, hour and a half for Lowell. 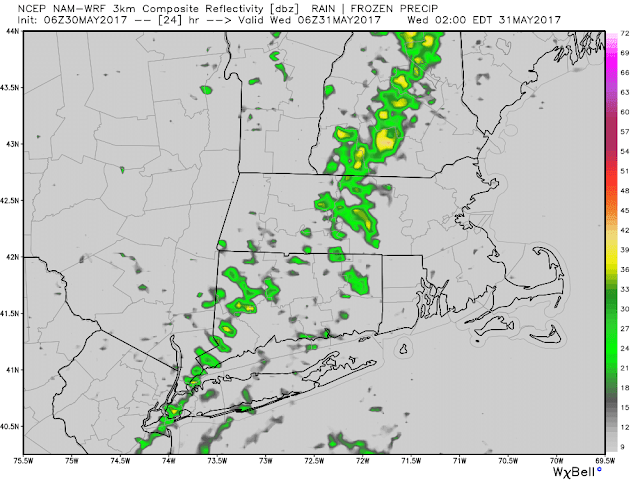 The thunderstorm is expected to collapse as it reaches the marine layer, depicted by the solid line from Hingham to New Haven. A special weather statement has been issued advertising pea-size hail and winds 30-40 MPH for the greater Springfield area through 630 PM. Frequent lightning will make outdoor conditions dangerous over next hour or so. The Storm Prediction Center in Norman, OK has issued a *Severe Thunderstorm Watch* until 9 PM for interior New England and Upstate New York. A wind gust is considered severe at 58 MPH. Severe hail is greater than 3/4" in diameter. 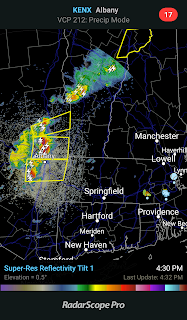 Thunderstorms are erupting in Vermont and as they approach Albany. The sun is peaking out in parts of Central and Western Massachusetts. The sun is plentiful in Eastern NY and VT. The latest simulated radar is advertising some nice looking storms between 6-8 PM out west. 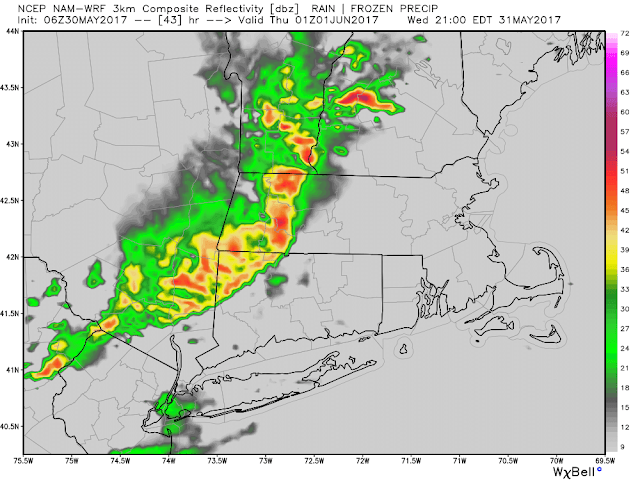 Some residents of Southern New England will have to keep eyes and ears to the sky today as thunderstorms are forecast to roll through Western and Northern communities this afternoon and evening. Some folks may even have to dodge a stray afternoon shower but the main action will be after 3 PM. 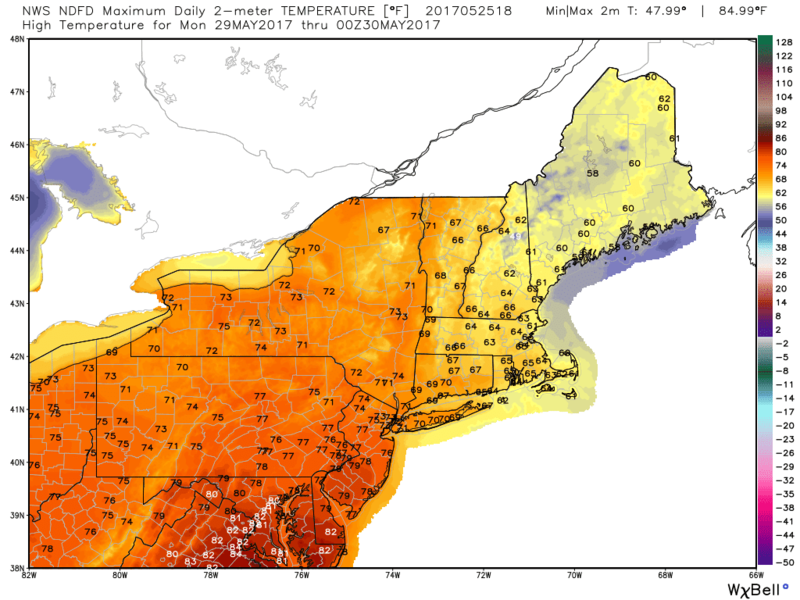 Temperatures will climb into the low 70's for most, although a few of the higher elevations may top out in the upper 60's. Some rain showers are present in the Hudson River Valley and off the South Coast. Dense fog developed this morning in Southern Worcester County, RI, and SE MA. Visibilities are improving and the dense fog advisory will expire at 10 AM. The sun is out in upstate New York and PA and this is moving east towards New England. 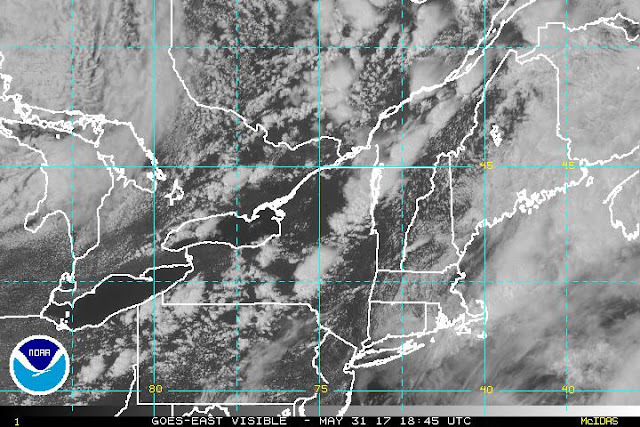 You may be able to see the spin in the clouds north of the Great Lakes. Trailing from the center of this storm is a cold front that will serve as a trigger for showers and thunderstorms this afternoon across the Northeast. The low south of the Islands is responsible for the showers across S CT, RI, and MA this AM. That boundary also separates the true summer-like air from the more seasonable 70's we will see today. Temperatures will be in the low to mid 80's around DC. 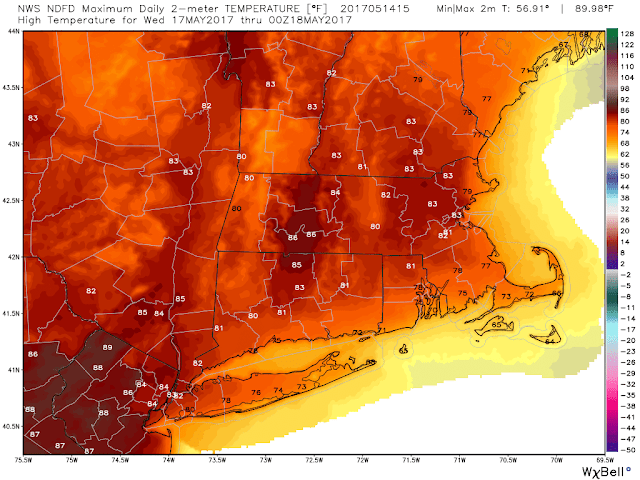 The Hudson and Connecticut River Valley's will be the warmest spots in our local region today. NW CT, W MA, S VT, and SW NH will have to watch the radar's beginning around 3 PM. Here is the 18-hour simulated radar beginning at 8 AM and ending at 2 AM Thursday. This model is advertising storms for some, but not all. South of the MA Pike, little to no rain is possible as the dreaded marine layer will erode the storms as they move east this evening. The marine layer is the thunderstorm slayer in the Blackstone Valley and SE MA. That said, the storms will really ramp up in the western and northern zones, especially after 6 PM. Some communities will see over a half inch of rain while others will see almost nothing. A brief tornado is possible in Berkshire, Franklin, and parts of CT, VT, and NH in any supercell that develops. Hail and damaging will be a more widespread hazard. 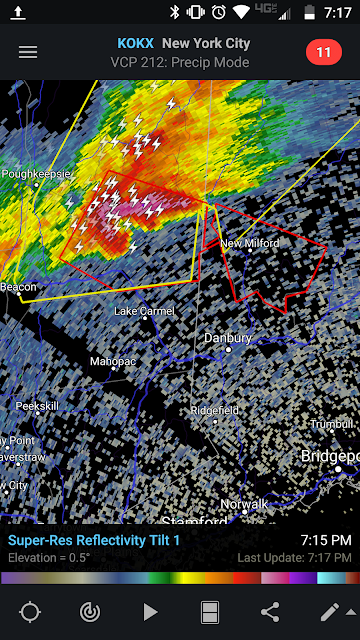 If any storm survives the journey to the Blackstone Valley wind would be the primary hazard besides lightning. The front will move offshore tomorrow AM. Thursday is the pick of the week. Temperatures will be in the mid 70's as we welcome June and meteorological summer. Winds will gust out of the west 10-15 mph. Cold air aloft will generate a few isolated showers tomorrow afternoon. Showers are possible on Friday and Saturday but neither day is forecast to be a washout. I am tracking a coastal storm for later Sunday PM into Monday AM. If the atmosphere gets excited this afternoon I'll post a live blog with updated Severe Watches/Warnings. High pressure will protect Southern New England from rain showers today even as skies remain mostly gray and temperatures stay 10 degrees below normal. The optimist would say 10 degrees below normal is still 10 degrees warmer than yesterday. Landscapers, golfers, and other outdoor industries will take the break from precipitation because more is in the forecast later this week. An upper-level low is spinning north of the Great Lakes, while an upper-level ridge sits in the Southwest Atlantic Ocean. Temperatures spiked into the mid to upper 90's in South Florida this weekend, setting the record for warmest May temperature on record. There are two weak frontal boundaries present across the Eastern US. One is at the leading edge of the ULL (upper-level low) and the other separates the ULR (upper-level ridge) from the ULL. As of 630 AM rain was falling in Western NY and PA. Weak high-pressure offshore of New England will protect the region from precipitation during the daylight hours. Winds will shift to an SW/S orientation this afternoon. Temperatures will be in the mid to upper 60's with most places reaching these levels during the late afternoon. 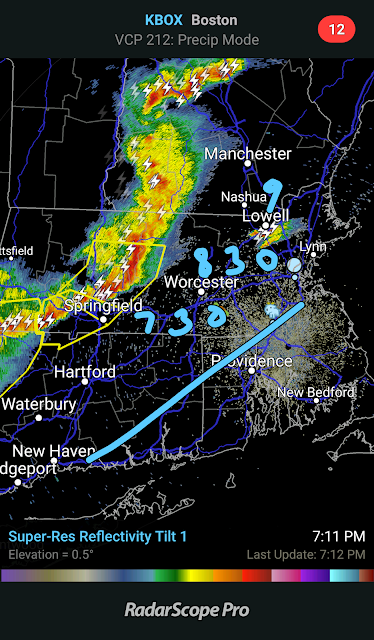 As the front slowly moves east some showers will get into Western New England tonight. They will get into Central and Northeast MA after midnight. The showers will fall apart by the morning. Low pressure passing south of the region will bring some heavy rain close to the Cape, Islands, and South Coast. Skies will be mostly cloudy tomorrow but temperatures will reach the low 70's. The cold front will still be to our west tomorrow afternoon. Most of the afternoon and early evening is dry. Here is the projected surface chart at 8 PM. Western New England will have to be on the lookout for strong to severe thunderstorms between 8 PM-10 PM tomorrow evening. The Storm Prediction Center is highlighting a "marginal" chance of severe weather. The simulated radar shows a healthy line of thunderstorms near Springfield by 9 PM tomorrow. It looks menacing but this will fall apart rapidly as it reaches the marine layer in Central/Eastern SNE. By 11 PM not much is left of the line. Seasonable weather returns on Thursday with temperatures in the low to mid 70's. Thursday looks to be the pick of the week as partly cloudy skies will make for a spectacular first day of June. Winds will be gusting out of the west 25-30 MPH. Showers return to the forecast on Friday but temperatures should stay in the mid 70's. The weekend looks unsettled, but Saturday night looks mostly dry. Sunday may be a washout for those having graduation parties. I apologize for the lack of posts in recent days. I've been working on several projects that require a higher priority than the routine mid to late spring weather pattern. 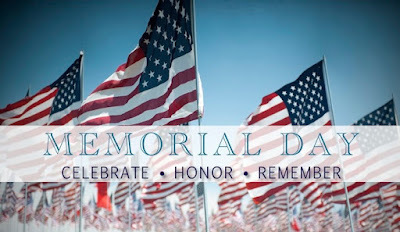 Memorial Day weekend is a landmark for most Americans. First and foremost we pause to remember those who died fighting for our right to live freely. It's also the unofficial start to the summer season and many Americans party in honor of the long weekend. Many of these parties are outdoors which require a decent weather forecast. There may be a chance of showers but should you make alternative plans? Low pressure tracking northeast and a front south of New England have brought more rain to the region. So far this month 3-6" has fallen across most of SNE. At the surface, the low is slowly tracking northeast. The center is shown here near Washington, DC. There is a strong air mass contrast south of the warm front and north of it. This allowed for the rain shield to blossom well ahead of the actual storm center which has occluded back in Ohio. At the same time, the low in the Mid-Atlantic is gaining strength. As a result, some stronger thunderstorms are shown on the radar in VA and NC but the main rain shield is in Upstate New York, Canada, and the Ohio Valley. The radar may appear to be breaking up across SNE but as the low deepens and moves northeast the rain shield will fill back in. Showers, fog, and drizzle will continue through this evening. Steady rain will return around 11 PM from South to North. Temperatures this afternoon will remain in the low 50's but as the warm front gets closer this evening the South Coast, Cape and Islands will climb into the 60's. Here is the 18-hour simulated radar ending at 7 AM tomorrow. At 8 AM the center of the storm will be near Boston Harbor. 1-2+" of rain is likely as this moves through. Some of the stronger rain bands will contain thunder and lightning so don't be surprised if you wake up in the early AM hours. Rain will linger through the Friday AM hours. 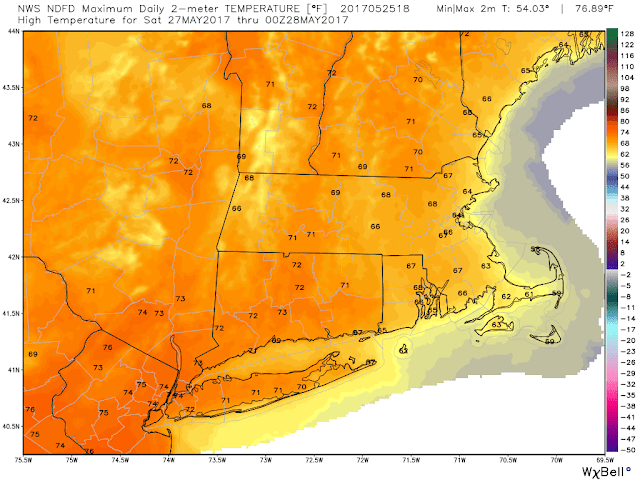 While no one will confuse tomorrow afternoon with a nice day, the sun will try and peak out and the late May sunshine will help kick temperatures into low 60's. A few spot showers will be possible thanks to cold air aloft. The closer to the coast one is the less of a chance they have to see peaks of sun before she sets for the evening. The low will take its time meandering east so the clouds, fog, and drizzle will also be slow to leave. Clearing skies Friday night will allow for temperatures to drop into the upper 40's/low 50's in SNE and low to mid 40's in Northern New England (NNE). Winds will shift to the WNW on Saturday. 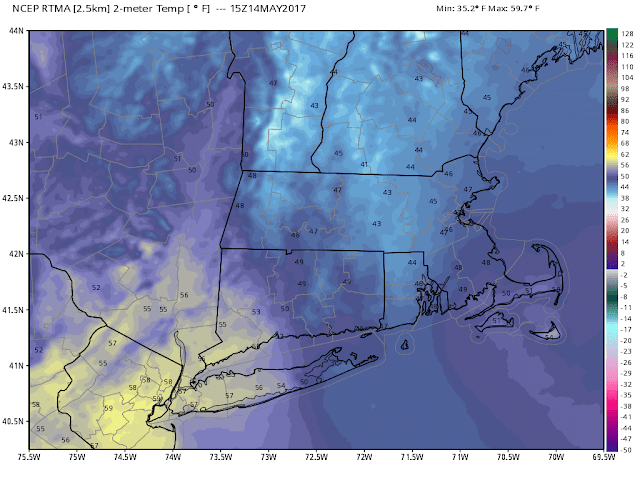 Temperatures will rise into the low to mid 70's in Western MA and CT while everyone else gets into the upper 60's. 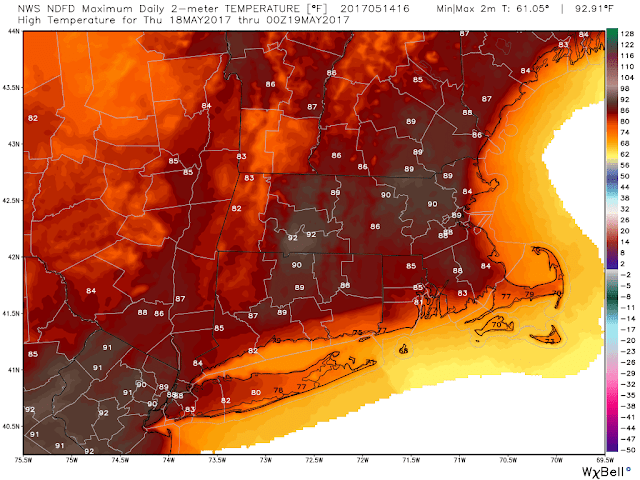 A sea breeze after 3 PM will add a chill to the air in Eastern MA, RI, South Coast, and the Cape and Islands. Skies will be a mix of sun and clouds. Sunday will be similar to Saturday. 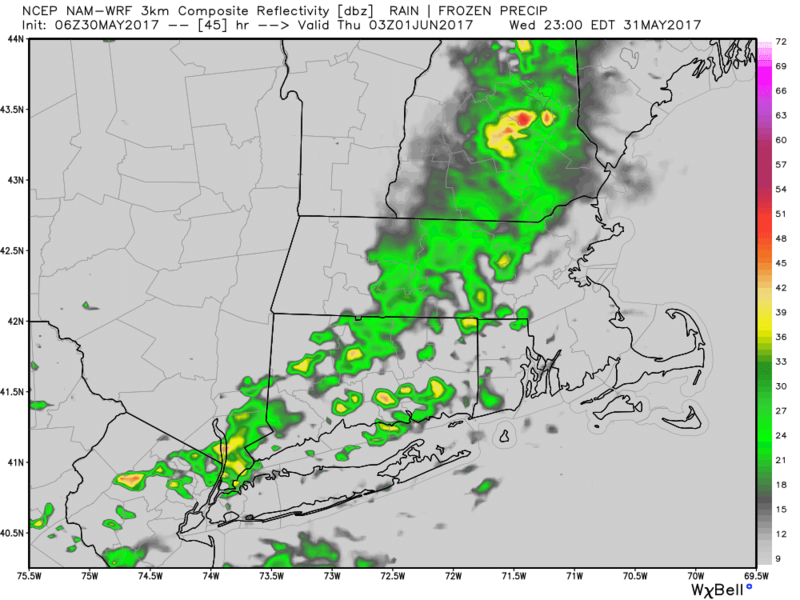 Could there be a spot shower in the mountain regions of Western and Northern New England? 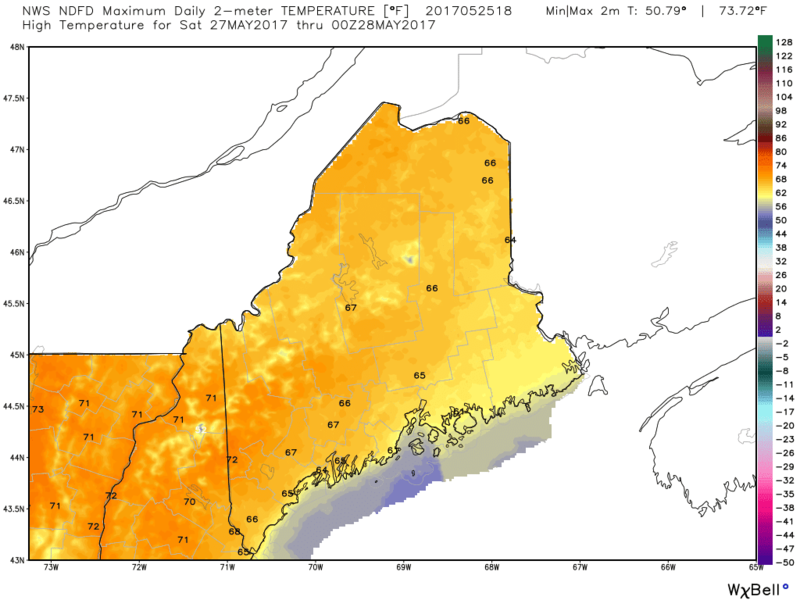 It is possible but again there will be widespread upper 60's and low 70's. 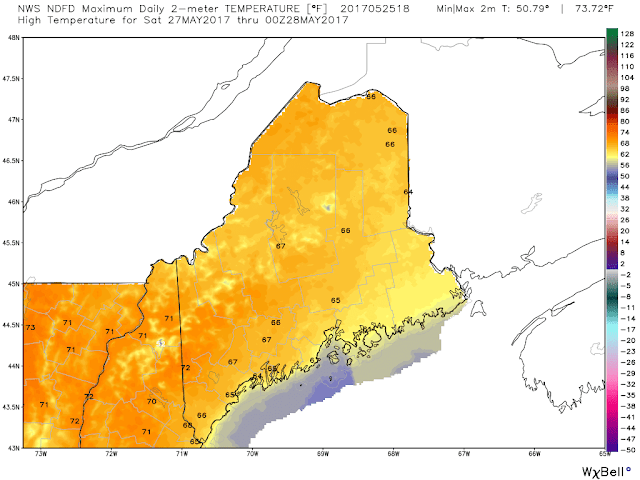 Sunday may end up being a tad cooler than Saturday thanks to mostly cloudy skies. It would be nice if communities could move any Monday AM parades to Sunday because some rain is likely for the holiday. Low pressure moving south and east of New England will interact with upper-level energy to our northwest. Here is forecast surface chart Monday 8 AM. That is a lot of action around the Mid-Atlantic and Northeast. Odds are many communities will see at least some rainfall. Temperatures will be in the low to mid 60's. This bears watching because the low is forecast to be weak and the interaction needs to take place at the right place and time for any steady rain to fall. Given the weather pattern, I wouldn't bet against it. Prepare to alter outdoor plans on Monday, but I would advise against canceling anything yet. Summer Like Heat Means Summer Like Storms? 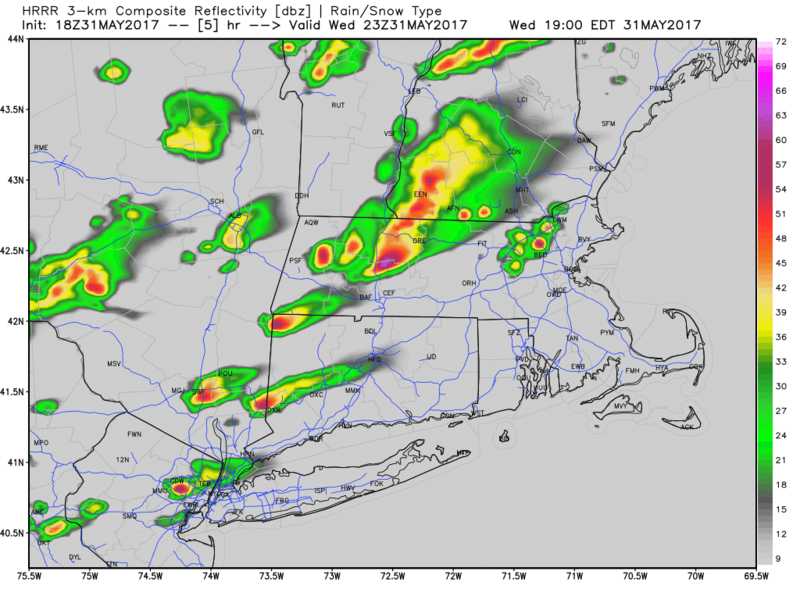 Short range, high-resolution computer guidance is suggesting the possibility of strong to severe thunderstorms this evening across Southern New England. A lot of ingredients for nocturnal thunderstorms will be present across the region from early this evening through midnight. 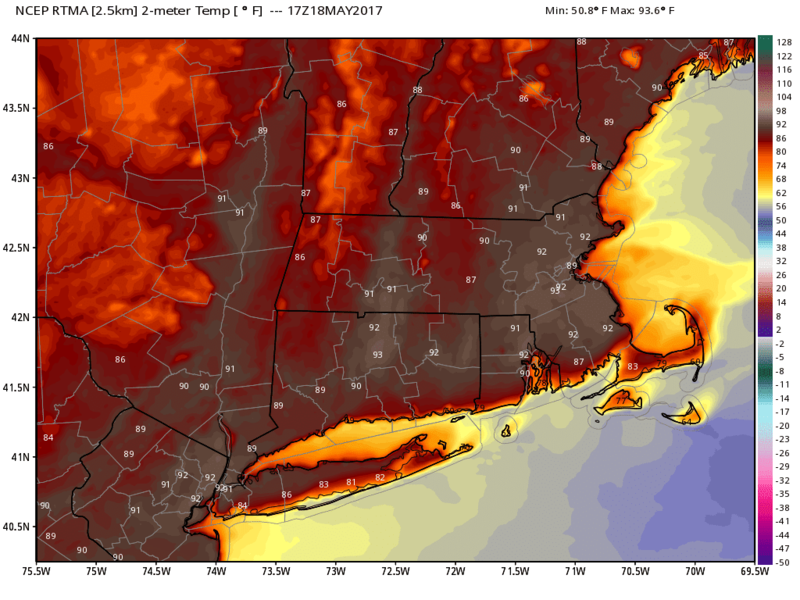 The atmosphere will be unstable thanks to blistering mid-summer heat that has taken hold over the past 2 days. A sea breeze is protecting communities along Narragansett Bay and on Cape Cod. Temperatures will continue to rise, even as a few clouds develop in Southeastern New England. These should burn off by late afternoon. To our west lies a cold front. 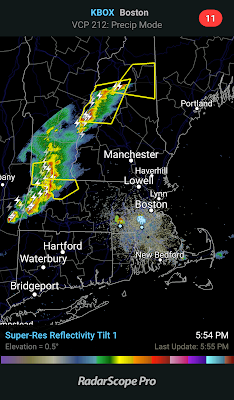 The current Northeast regional radar does not look all that impressive. Some convection is firing in Western New York, but nothing significant at the moment. The simulated radar loop, however, looks very impressive as we move forward this afternoon/evening. This afternoon and early this evening will be dry, just hot. Thunderstorms are expected to enter Western New England after 8 PM. The worst of the weather in Worcester County will be after 10 PM and before midnight. A weakened version of the storms will exit Eastern Massachusetts around 2 AM. In these thunderstorms, we can expect heavy rain, lightning, and strong to damaging winds. It's a bit early in the season for nocturnal thunderstorms, but it is also early in the season for mid to upper 90's. Shut the car windows this evening before turning in! I'll live update this blog as needed this evening. Low pressure off the New England coast will send backlash rains and winds across Eastern New England this afternoon through the night and into Monday. The rain will end midday tomorrow and my Mother's Day gift to all will be a return of warm weather Tuesday. I tried to have it sent for today but Mother Nature does what she wants when she wants (like a good woman should). I'm pretty sure my own beautiful mother does not read my blog so she won't know her gift is on back order and I'd appreciate if no one told her. She doesn't like to be "on the internet" anyway. Temperatures as of 11 AM were in the 50's in SE MA but 40's everywhere else. 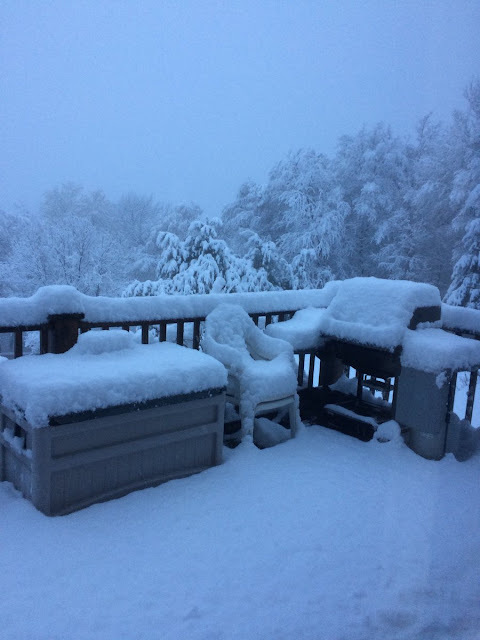 Look what happened in the higher elevations of Vermont this morning. This is shades of 1977 (perhaps we can thank climate change for missing out on this snow). I saw the potential for a few flakes when looking over the data yesterday, but nothing I saw indicated that a plowable snowfall was likely or imminent. Our neighbors in northern New England woke up like this. 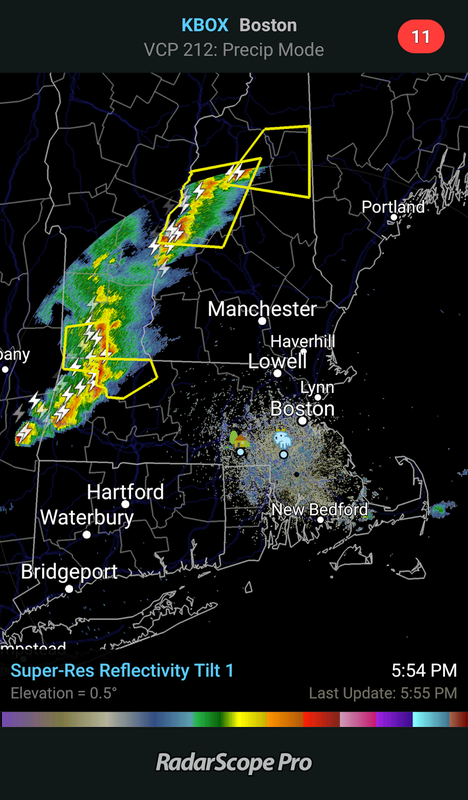 Here is the northeast regional radar as of 1148 AM. The precipitation in Southern New England is tapering off at the moment. 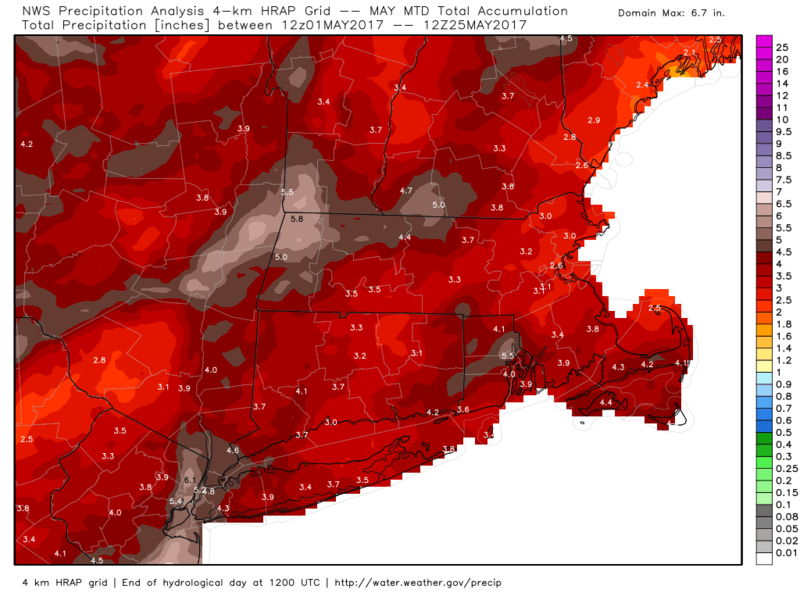 Over the past 48 hours, a general 1-2" of rain has fallen across Southern New England. This low is in no rush to leave the area. 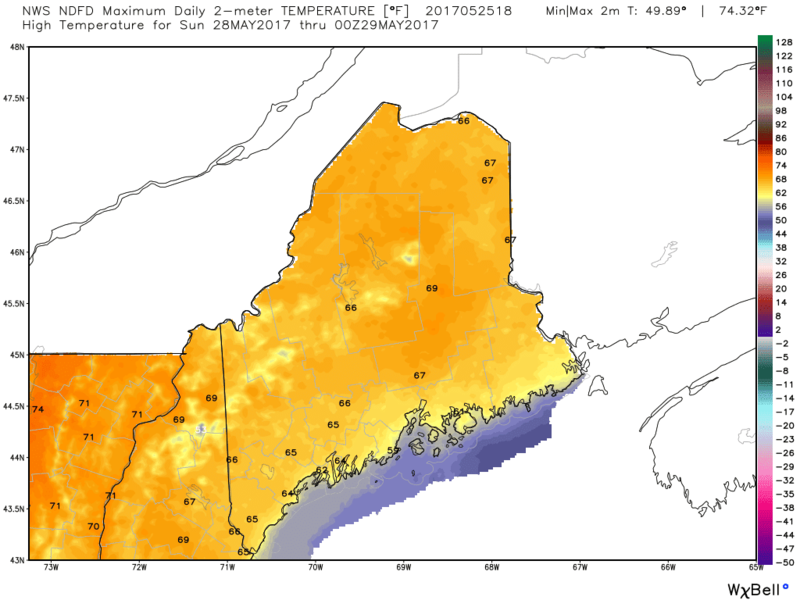 At 2 PM it will still be sitting and spinning off the Cape. Temperatures this afternoon will struggle to get into the low 50's. Most communities will max in the upper 40's away from SE MA. A break in the steady rain is expected over the next 1-3 hours before rain fills back in across Southeastern New England. Here is the 18-hour simulated radar GIF through 4 AM Monday. Some thunder and small graupel will be possible in Western MA/CT later this afternoon. It's sunny in CT but that won't be able to make it to Worcester County thanks to easterly flow off the ocean keeping clouds and drizzle around. The ocean storm will also stall, which keeps this rain shield around through midday Monday. Temperatures tonight will stay in the mid-40s. NE winds will gust 20-40 MPH, with the strongest gusts at the coast. The low will move out Monday afternoon. Drying behind the front with some breaks of sun and strong NW winds will set the stage for a warm up. 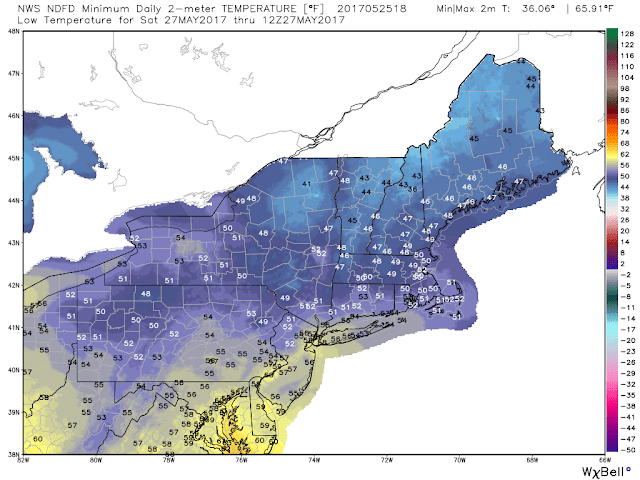 Monday max temperatures are expected to be in the low to Mid-60's. 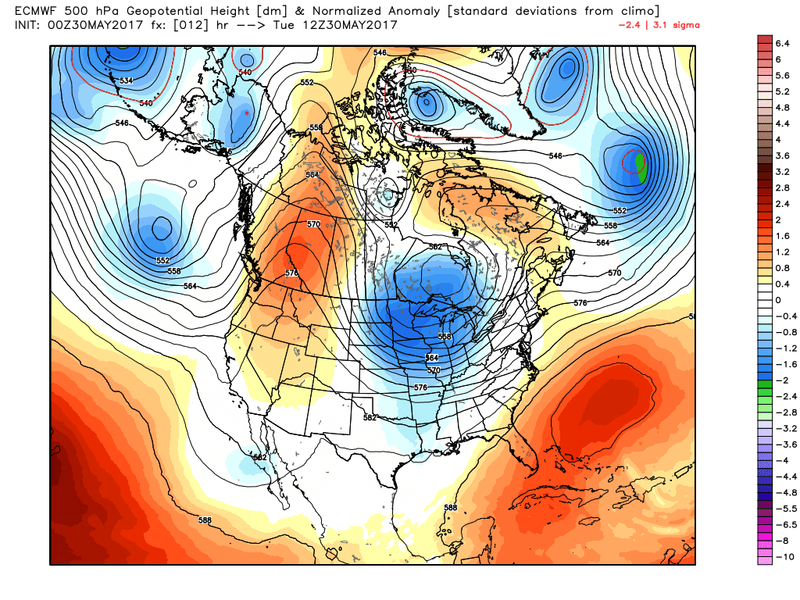 By Monday night our storm is in the Canadian Maritimes and high pressure will build from the Ohio Valley. Low temperatures will be in the upper 40's Monday night. A subtropical high will begin to build in the SW Atlantic on Tuesday. We will see dry weather with max temperatures in the 70's. Max temperatures on Wednesday will be in the low 80's. Thursday can I get a 90?